Ohsweken, Ontario – June 12, 2013 – Ohsweken Speedway’s 18th season of racing continues this Friday, June 14 when Six Nations Bingo presents Sunshine Foundation Night, featuring the Corr/Pak Merchandising Sprint Cars, Affordable Towing & Recovery Thunder Stocks, HRW Automotive Mini Stocks, and Gale’s Auto Aftermarket Bombers. Sunshine has been trusted by families and healthcare providers to make dreams come true for kids across Canada since 1987. The Sunshine Foundation is the only national Canadian charity to provide individual dreams to children with severe physical disabilities (such as spina bifida or cerebral palsy) as well as life-threatening illnesses. Sunshine is the legacy of a father’s love for his son. After losing his teenage son to muscular dystrophy, a London, Ontario police officer created The Sunshine Foundation of Canada to brighten the lives of other children and families by fulfilling their most cherished dreams – from meeting a sports hero, to seeing a foreign country, or having a special gift like an adaptive bicycle. Ohsweken Speedway is proud to partner with the Sunshine Foundation this Friday. Please visit www.Sunshine.ca for more information on the Sunshine Foundation. 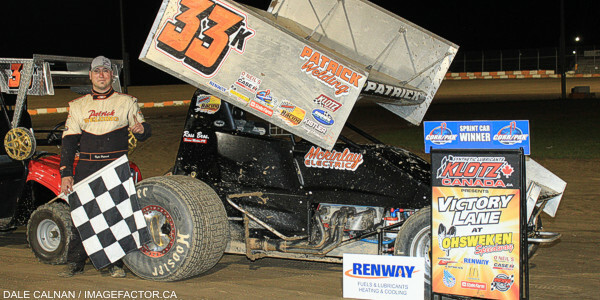 2011 champion Jim Huppunen drove from 12th to 3rd in last Friday’s Sprint Car feature, and took over at the top of the points standings as a result. Jamie Collard, Mitch Brown, Shane Ross, and Chris Steele round out the top 5. Kyle Patrick won his 4th career Ohsweken Speedway Sprint Car feature last Friday, and moved into a tie for 8th place on the all-time Sprint Car feature win list with Dave Dykstra, Ryan Hunsinger, Warren Mahoney, Mike Woodring, and Jared Zimbardi. AFFORDABLE TOWING & RECOVERY THUNDER STOCKS Cory Turner won his 2nd Thunder Stock feature of the season last Friday, and took over as the points leader in the process. Lee Winger, Chris Dickie, and Jim Lampman are 2nd, 3rd, and 4th respectively, while the #5h team of Devin Habiuk and Pete Reid is tied with defending champion Mike Thorne for 5th. Steve Hess currently leads the Rookie of the Year chase, and sits 19th overall in the Thunder Stock standings. Davey Boughton took his 2nd Mini Stock feature win of the season last week, and added to his points lead in both the Championship and Rookie of the Year standings. Robin Elliott came from the B-Main to finish 6th last Friday, and moved to 2nd in the points standings, followed by the #66 team of Jon and Brandon Janssens, Laura Hughes, and Alex Schuts. Brady Longboat won his 2nd straight Bomber feature last week, and now enjoys a 12 point margin over Jesse McDonald in the championship standings. Tim DeBoer moved up to 3rd in the standings with a runner-up finish last week, while Dusty DeBoer, and Max Chechalk remain in the top 5. 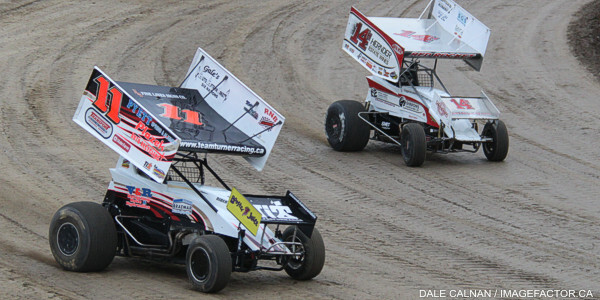 Start times for weekly Friday night racing events at Ohsweken Speedway have changed for 2013. The pit gates will normally open at 5:30pm, and spectator gates will continue to open at 6:00pm, while the first race will now take the green flag at 7:30pm. Ohsweken Speedway’s 18th season of racing continues this Friday, June 14 when Six Nations Bingo presents Sunshine Foundation Night, featuring the Corr/Pak Merchandising Sprint Cars, Affordable Towing & Recovery Thunder Stocks, HRW Automotive Mini Stocks, and Gale’s Auto Aftermarket Bombers. 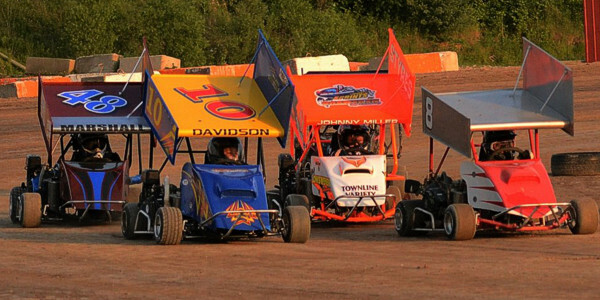 Weekly Friday night racing at Ohsweken offers affordable, exciting, family entertainment just a short drive from many Mid-Western Ontario locations. Weekly Friday night racing adult general admission is just $12, while admission for seniors and students is $10, and kids age 12 and under are admitted FREE! Spectator gates open @ 6:00pm, with the first race taking the green flag at 7:30pm this Friday, June 14! Visit the new official Ohsweken Speedway website at www.OhswekenSpeedway.com and Feel The Excitement!